Yellowcog is now off to the Barber Motorsports Park, Alabama, for the IndyCar testing. Thanks to all those who’ve helped with this project so far. There will be a full report in a few days! Rallye-info.com published an article last week (http://www.rallye-info.com/article.asp?stid=11343) about yellowcog’s motorsport driver safety technology, named Pilot™, in the recent rally in Kenya. The article explains how the course medics were able to monitor drivers’ vital signs remotely. The importance of having such physiological information was shown when Geoff Bell and Tim Challen rolled their Datsun 260Z in spectacular fashion! They both escaped serious injury but the changes in the physiological data in the moments after the accident were dramatic, as can be seen from this Google Earth map. 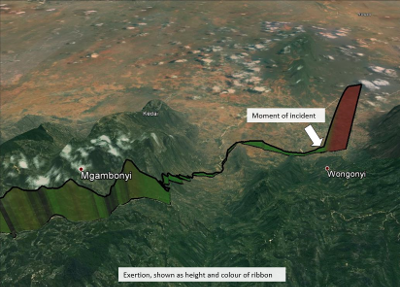 The map shows a combined ‘exertion index’ where the height and colour of the ribbon shows how extreme the vital signs were. This sort of information can be used to tailor the response of the medics, for example by prioritising the person most in need. We are proud to announce that yellowcog has been named a Microchip Authorised Design Partner. Yellowcog has decades of experience in designing hardware and software for Microchip devices. Becoming a design partner means that our customers can be sure of our expertise. We use microchip parts - from voltage regulators to processors - in many of our designs and products. Microchip’s PIC24 and PIC32 range of processors allow us to use the same software libraries across all of our projects. This means in a few clicks we can retarget our software from frugal nanoWatt sensor modules to running power-hungry digital signal processing applications. Yellowcog specializes in designing with Microchip products. Visit the Microchip Technology web site for more information by clicking here. The upcoming East African Safari Classic Rally is to use yellowcog’s Pilot physiological monitoring system. Three cars will be kitted out for the rally which starts 21st November 2013 and runs through to 29th November. The driver of each car will be monitored for the full duration over the 4100 kilometre course across Kenya and Tanzania. Just like at Le Mans we will be monitoring heart rate, breathing rate, core temperature and a host of other parameters such as g-forces. The rally is an exciting and interesting next step for yellowcog as our products are being used primarily for driver safety. The cars are travelling vast distances and are isolated for long periods. The rally course is also inherently more dangerous than a race track since it is an open course with challenging terrain. The rally organisers are experts in dealing with these challenges and have a set of vehicles and helicopters that are used to respond to incidents. However, if a driver crashes and cannot be contacted it is impossible to know what condition they are in until visual contact is made. With Pilot the medics are now able to see a driver’s vital signs immediately and prioritise responses accordingly. The driver wears a comfortable chest-band (or light-weight garment) underneath their usual clothing. The vital signs of the driver are transferred wirelessly to the matchbox-sized Pilot device mounted elsewhere in the vehicle. The information on each driver is displayed live in the medical helicopter and anywhere else with internet connectivity. The yellowcog logo is now a registered trademark. It's a bold and distinctive logo so we weren't worried that it would be opposed by anyone but it was still exciting to receive an email from the Intellectual Property Office saying that the opposition period had ended and that the mark is now registered (UK00003018234). We haven't decided if or where the little ® is going to go yet (are we the generic-top-right-spot sorts?). The process was all very easy and two things stood out: firstly is that the IPO site is yet another government site (.gov.uk) that works really well (another example would be the HMRC site); second is that by registering a trademark you get a lot of scam "invoices" through the post asking you to pay for further "registration". Amusingly, the IPO themselves were sent a scam invoice by one of these companies when they registered a mark for themselves. Yellowcog has reached its third birthday today. Many thanks to all our customers and all those who've supported us. Here's looking forward to monitoring more things, places, runners, jumpers and racing drivers!